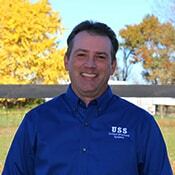 Chris Taylor is the Operations Manager for USS. Chris started working at USS in 2005 as a Technician. After four years working his way through the ranks Mr. Taylor became Operations Manager of USS. Prior to USS Mr. Taylor worked in various factorial and agricultural positions for 35+ yrs. From growing up on a dairy farm to making steel cord for radial tires, plastic sheeting and seat covers for Toyota and the last 13 yrs with USS. He has been married to his wife Susan for 16 yrs. they have 2 daughters Emma 12 and Sarah 8 and live in Danville, KY. They enjoy going camping, the outdoors, golf, shooting and spending time with family and friends.